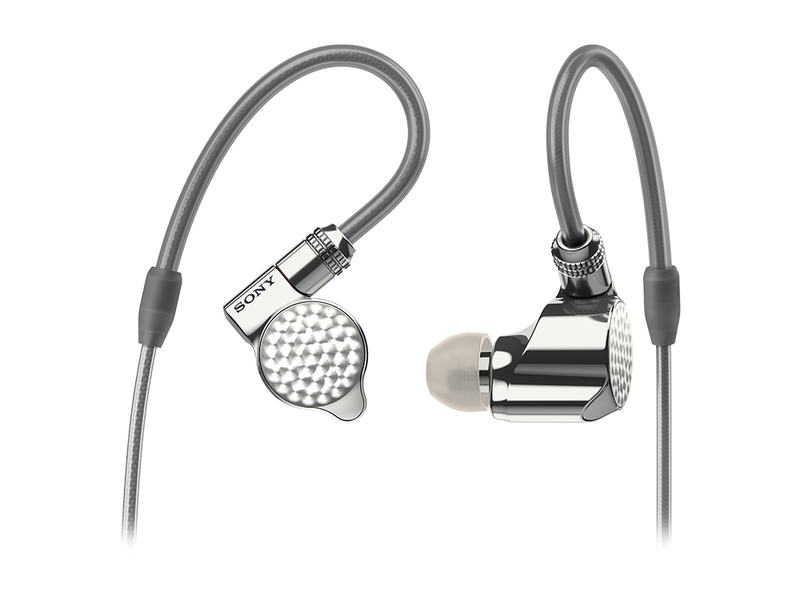 Sony today expands its Signature Series with a new line of exquisite audio products - the IER-Z1R in-ear headphones and DMP-Z1 digital music player. The products harness decades of audio expertise, proudly showcasing Sony’s relentless lifetime pursuit of sound excellence. The Signature Series advances sound to an entirely new realm of audio engagement — taking the experience from listening to feeling it. Delivering an immersive music experience, the IER-Z1R headphones feature a HD hybrid driver system consisting of three newly developed Sony-designed drivers. As the driver unit’s sound, quality and consistency of sound character are critical to a headphone’s sound, an advantage of Sony-designed drivers is that it ensures a preservation of consistency in sound signature from driver design stage to the finished product. The 5mm dynamic driver is constructed with a newly developed aluminum coated LCP (Liquid Crystal Polymer) diaphragm and external magnetic circuit allowing it to reproduce the ideal frequency response of up to 100 kHz. Strategically placing the 5mm dynamic driver coaxially against the sound path accurately delivers the sound from the super tweeter directly into a listener’s ear canal. A frequency response of up to 100 kHz provides the experience of a live concert hall atmosphere for users anytime, anywhere. The 12mm dynamic driver’s diaphragm features a magnesium alloy dome which is light weight yet highly rigid. The dome’s edge is made from aluminum coated LCP which offers flexibility for optimal bass reproduction and high internal loss. These materials work in sync to give listeners fine details and crystal clear sound. In addition, the diaphragm of the balanced armature unit for reproducing high range sound is made from magnesium alloy. Working together with a newly developed silver coated copper voice coil and gold-plated terminals, they increase the driving force of the balanced armature unit to faithfully reproduce sound without losing the tiniest of micro signals. Perfectly controlled acoustics of the IER-Z1R is achieved by the Refined-phase structure which features a magnesium alloy inner housing that delivers to listeners a natural sound with precise sense of image projection never experienced before. All three drivers; the 5mm dynamic driver, 12mm dynamic driver and balanced armature driver unit are built into the inner housing which works as an optimal sound path. Sound coming from each driver is optimally blended in the sound path which ensures ideal phase response and clear separation. Magnesium alloy also eliminates unnecessary vibration due to its high rigidity and internal loss. Advanced sound space control technology was applied to finely control air flow at the rear of the drivers. Ventilation is accurately controlled by connecting the acoustic tube to the extended acoustic cavity behind the driver unit. This unique-to-Sony sound control method reproduces a wide sound stage with rich and accurate mid notes, a harmonious sound signature from low to high frequencies and an overall smooth sound reproduction. Sony’s dedicated audio grade film capacitor for crossover network circuits was used in the IER-Z1R, delivering a refined sound with low distortion. The film capacitor was developed after numerous listening tests. In addition, a Sony-developed dedicated audio grade solder was also used to minimise loss in the signal path and ensure purity of contact. High sound quality balanced connection is achieved with the supplied 5 pole 4.4mm balanced standard cable or the use of optional cables. Silver coated OFC (Oxygen-Free Copper) is used in the supplied cable. Sony has evolved the plating structure of the plug and mmcx terminal to gold plating with an undercoat instead of the commonly used magnetic material such as nickel which disrupts signal flow. The supplied cable also features natural silk thread that reduces touch noise work as an insulator and damper against vibration. Last but not least, the supplied cable features twisted pair wiring, thereby reducing signal transmission loss to preserve the signal purity and achieve intense high resolution sound. In addition, optional cables engineered with KIMBER KABLE® are available for additional ways to enjoy high resolution sound. With accumulated ear shape database collected over decades of research, the IER-Z1R is designed for comfortable yet stable wear via its optimised housing shape, 13 variations of ear buds (six variations of triple comfort ear buds and seven variations of hybrid ear buds) and pre-formed ear hangers. This exquisite pair of headphones also boasts a zirconium alloy outer housing for increased hardness, corrosion resistance and durability. The face plate of the IERZ1R features an elegant “Perlage” pattern distinguishing the headphones at a glance. 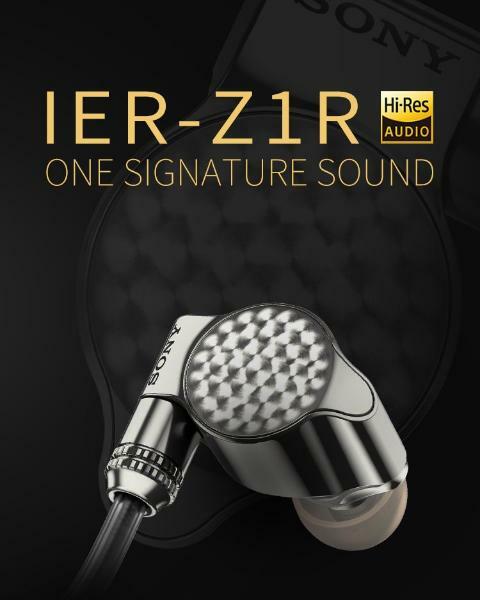 The IER-Z1R is meticulously hand-crafted using only the finest top-grade materials by skillful artisans in Japan, allowing audiophiles to fully immerse themselves in their favorite songs as the artistes and sound engineers intended for them to be heard. 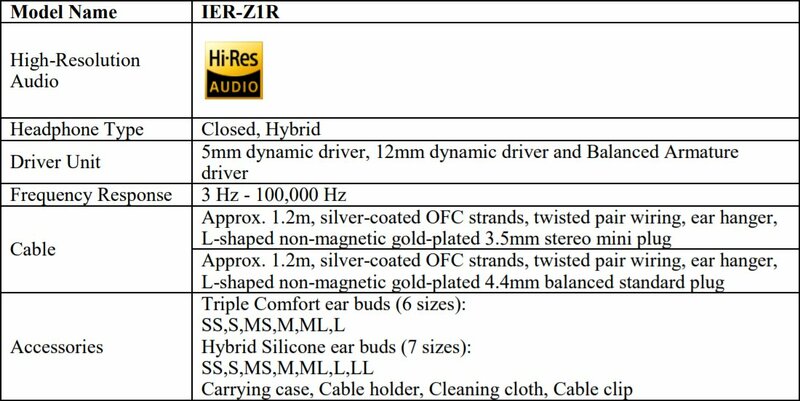 The IER-Z1R will be available from November 2018 price from HK$13,990 or 1500 Euros. Leave your thoughts and comments below. sure whether this post is written through him as no one else realize such certain approximately my problem.